Trinity Waters and the Texas A&M AgriLife Extension Service will be hosting a third and final round of workshops for landowners in the Trinity River basin area, coordinators said. “The focus will be on beef cattle production and feral hog control so producers can improve profitability, reduce hog damage and benefit area water resources,” said Blake Alldredge, AgriLife Extension associate and education and outreach coordinator for Trinity Waters, College Station. 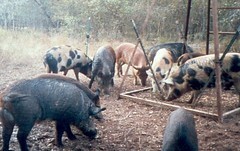 While drought has negatively affected cattle numbers statewide, the feral hog population has continued to increase, Alldredge noted. Alldredge said this third round of informational workshops for area landowners is provided at no cost and is open to the public. Two hours of continuing education units—1.5 general, 0.5 laws and regulations—will be available for participants as well. The workshops will take place at the following dates, times and locations: Feb. 27 from 1-5 p.m., Navarro County Expo Center, 4021 W. Highway 22, Corsicana; March 27 from 1-5 p.m., Walker County Extension Office, 102 Tam Road Suite B, Huntsville; and April 3 from 1-5 p.m., Texas Freshwater Fisheries Conservation Center, 5301 County Road 4812, Athens. To RSVP for one of the workshops, contact Alldredge at 979.845.0916 or balldredge@tamu.edu, or see nrt.tamu.edu/schedule. The Building Partnerships for Cooperative Conservation in the Trinity River Basin project is managed by the Texas Water Resources Institute and funded by the Texas State Soil and Water Conservation Board through a Clean Water Act grant from the U.S Environmental Protection Agency. Read the full AgriLife TODAY article for more information.